So I've always really enjoyed reading, but in the past felt like it was hard to find any great books. I would try to read Oprah's suggestions but they were always too filthy and foul for my taste, and never finished them. I love being able to find books that other friends have already read and recommend. Over the last two years I have been reading much more and have really found some treasures. In 2011, I set the goal for myself to read 12 books, one each month, and I did it. This year, I haven't really set a goal for myself except that I want to read a lot more than 12 books and watch much less television. So while I was sick in February, I had many sleepless nights and days filled with hours and hours of coughing. This meant I had lots of time for reading. I read 10 books last month, and along the way I fell in love with reading again. I have almost no desire to watch television now. Just want to read. Besides the books I listed in this post, these are some recent titles that I have loved/am enjoying. You may notice a theme... I LOVE historical fiction. + The Kitchen House by Kathleen Grissom. This novel is set in southern US on a tobacco plantation, late 1700's-early 1800's. I loved this book and it's characters. Though some of the situations were difficult to read, the author doesn't get too graphic. No foul language, though the book does deal with difficult subject matter, such as abuse, slavery, and adultery. 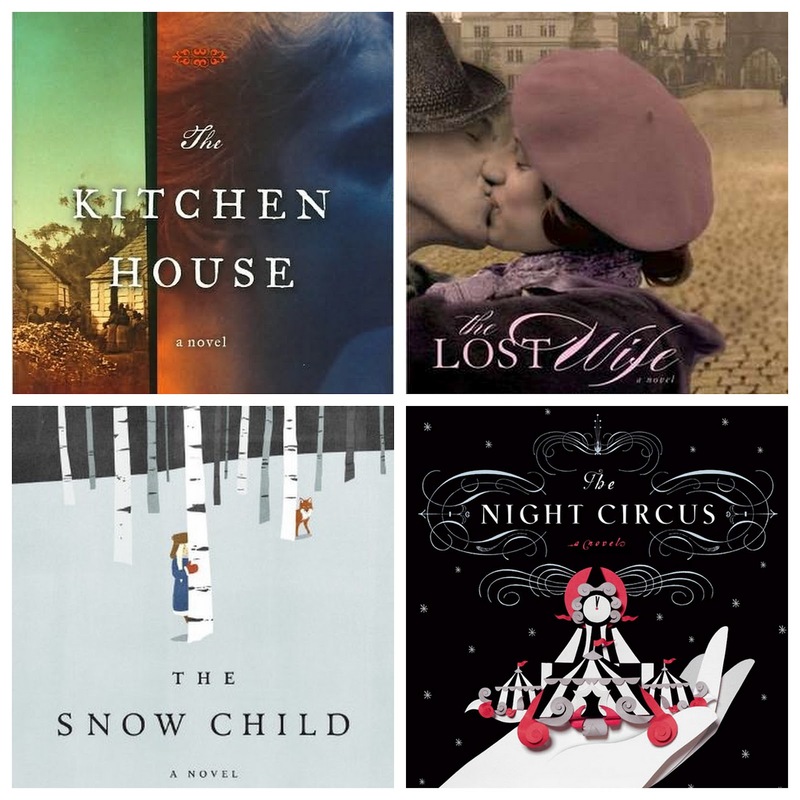 + The Lost Wife by Alyson Richman. A journey from pre-war Prague through WWII and the holocaust to modern day NYC. This book is both a beautiful love story and a heartbreaking tragedy. Many of my favorite books are set during the Holocaust, but this book took the horror and the pain of that time to new levels. Ultimately, though, it is the love story of Lenka and Josef that make this book so beautiful. Their story broke my heart and then carefully stitched it back together again. Warning: There is foul language in Chapter 51 of this book. + The Snow Child by Eowyn Ivey. Set in Alaska 1920's, this book is gorgeous. One of the most unique and beautiful stories I've ever read. I could not put it down. It's the kind of special, mesmerizing story that will stay with you always. This book deals with the struggle of miscarriage and infertility, loneliness and abandonment, but also speaks beautifully of marriage, motherhood, love, fatherhood and strength. Loved this one so much, and it definitely is in my top 10 favorites of all time. I'd love to hear of any books that you've enjoyed recently.